This funny chillin’ chicken was contributed by my fun dog trainer friend Yvonne. I saw it on her Instagram site and couldn’t resist sharing it. The chicken cooks like it is broasted with the skin nice and crispy-if you’d want to eat it, and the chicken nice and moist and tender after 45 minutes in a 400 degree oven on parchment paper in a large pizza pan with a rim, so the chicken juices don’t spill when you remove it from the oven. Before baking. I like to cook the chicken with the skin on because the skin bastes the chicken, especially the breasts, from becoming too dry. You can remove the skin after it cooks at high 400 degree heat if you like. 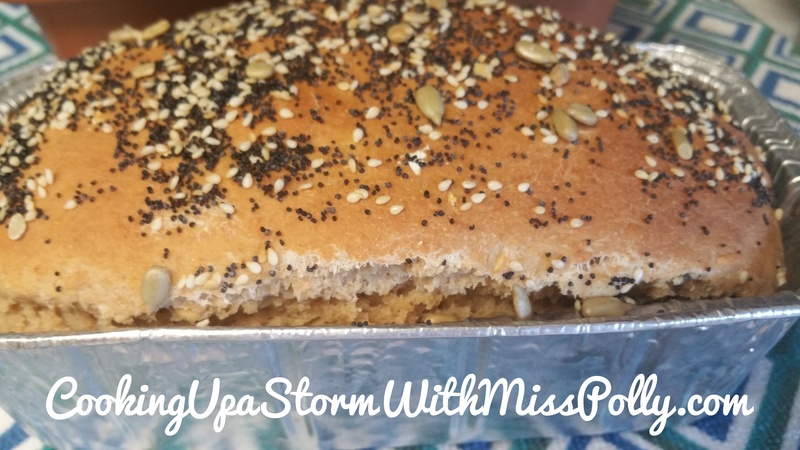 Bake 30 minutes at 400 degrees on parchment paper, which is better for the environment, and can be thrown away leaving you with hardly any clean up! Parchment paper- I used Reynold’s Wrap brand, but any will do. 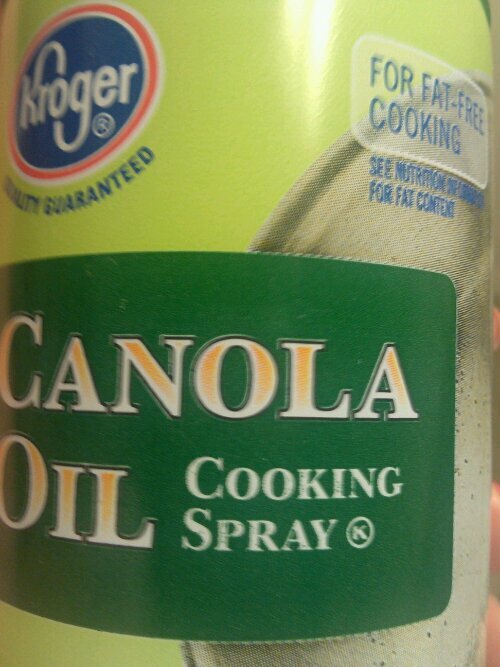 Canola oil spray or any brand of good Canola Oil Spray or Olive Oil Spray without weird colors in it. I use Kroger brand. After you test the bird with a sharp knife to make sure the juices run clear, take tongs and remove the chicken to a clean plate to serve. 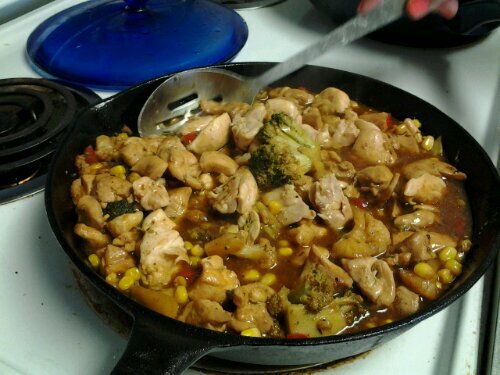 The chicken can also be cut and used in everything from tacos, tostadas, enchiladas, rice, pasta dishes etc. 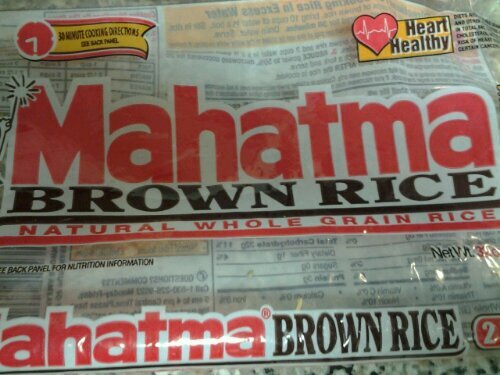 TO MAKE SOME OF THE BEST TASTING, HEALTHY, MULTI PURPOSE rice for use as a side dish or the basis of a fantastic vegetarian rice bowl with steamed veggies, tofu etc. 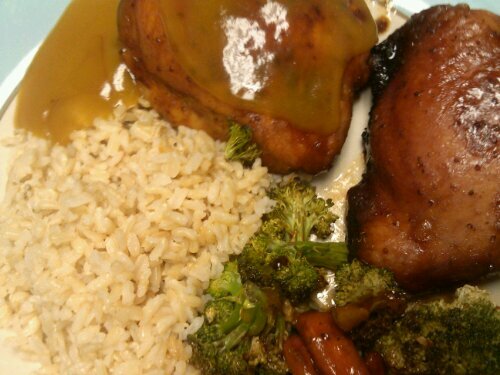 I made this for a healthy & delectable Honey Mustard Chicken over Pesto Whole Grain Rice & Steamed Veggies. Polly’s Picks rates Buitoni Pesto with Basil all natural pesto sauce 10 out of 10 best. Cover a medium sized sauce pan and heat on high til boiling. Reduce heat and simmer on low until water is absorbed into the grains of the rice and rice is tender and soooo delicious! 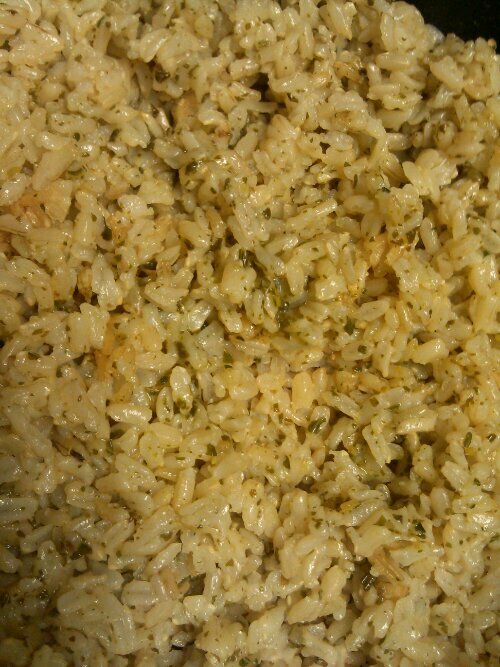 Add two or more tablespoons of Buitoni Pesto to the cooked rice and stir and serve. Note: Trader Giotto’s Basil Pesto is awesome too (in the deli section) by the hummus. 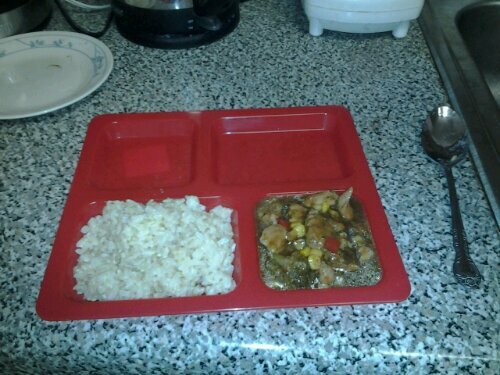 Served with cooked long grain brown rice and steamed vegetables makes a delicious healthy dinner. This is way easier than you might have guessed. 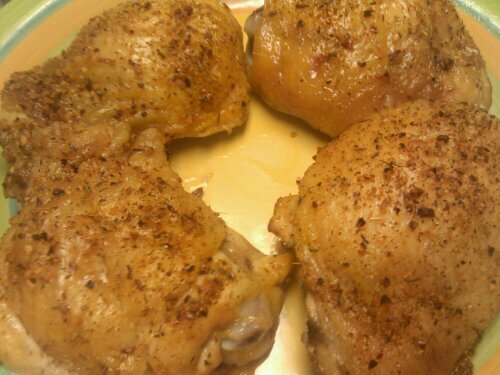 Take 4 large chicken thighs with skins with bones…sounds funny but I want to make sure someone doesn’t buy boneless chicken thighs-the cooking would be less. 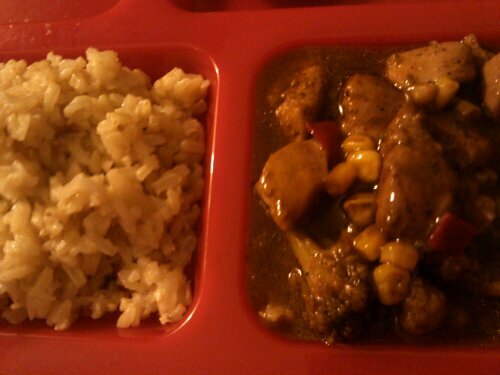 Take a quart size sturdy ziplock bag and add the chicken and pour some of the Honey Mustard Marinade in the bag. 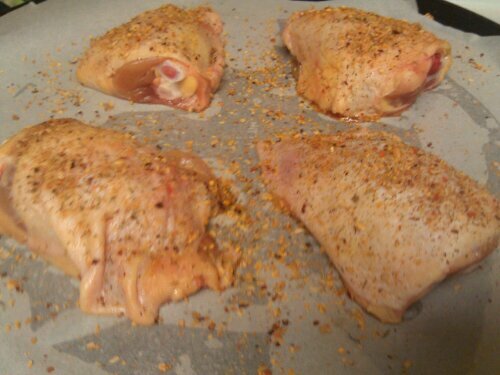 Mix around with your hands until all surface area of the chicken pieces are covered with marinade. Leave over night or a minimum of an hour for best flavor. 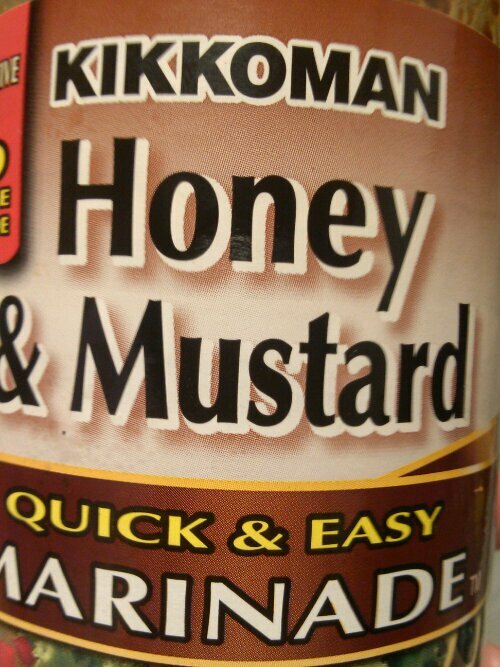 You can marinate as little as 20 minutes, but the honey mustard soy sauce flavor will be delicate. Grease a large lasagna size pan with non stick canola oil spray, add the 4 chicken thighs to the pan. Sprinkle vegetables like broccoli, cauliflower and baby carrots around the honey mustard chicken and bake or microwave until done and a knife inserted in fleshiest part is no longer pink. Bake in a microwave for about 20 minutes on high, if has a carousel inside, and then 20 more minutes, until done. Conventional: Bake at 375 degrees until done, checking after 30 minutes. Cook additional ten minutes if needed, until chicken is no longer pink when cut with a sharp knife. Chicken cooked with this marinade by Kikkomann is flavorful, reminiscent of soy sauce, with a flavor of wine and mustard seeds. When cooked ahead, as I did, you can make a wonderful rice bowl or noodle bowl with veggies for lunch for the next day. 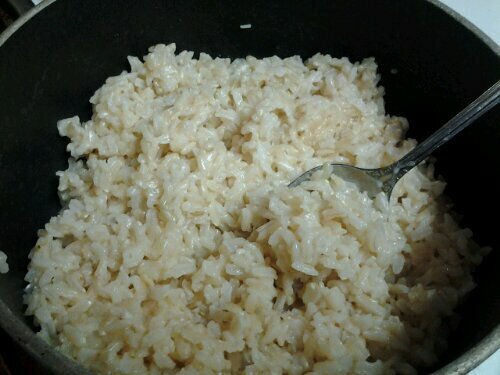 Take one cup of good quality long grain brown rice and mix it with 2-1/2 cups cold water, two tablespoons butter or margarine, and 3 teaspoons of minced garlic and mix in a medium size covered saucepan with heat on medium high. Once the rice and water start boiling, turn the heat to medium low, so the rice continues to simmer with the lid on, until all water is absorbed. Long grain rice takes about double the time as ordinary long grain rice or converted (parboiled) rice, about 45 minutes…(put on your microwave’s timer or egg timer or timer on your SmartPhone). When the rice is done, you will have 3 cups of fiber rich, potassium rich mildly garlic seasoned rice that will be perfect to go with the Fostada Chicken Vegetable Mix I made yesterday, made with Rick Bayless’s Frontera Fajita Marinade. More people eat rice than any other grain in the world and there are dozens of rices out there to try. Look at The World Market for some interesting ones, Whole Foods Market and Trader Joe’s….3 of my all time favorite stores for quality, uniqueness and overall value. Serve the Garlic Butter Long Grain Rice Brown Rice alongside some of the Fostada Chicken Topping or on it in a unique & addicting rice bowl. Makes a great take-along lunch too, like what I am doing today. 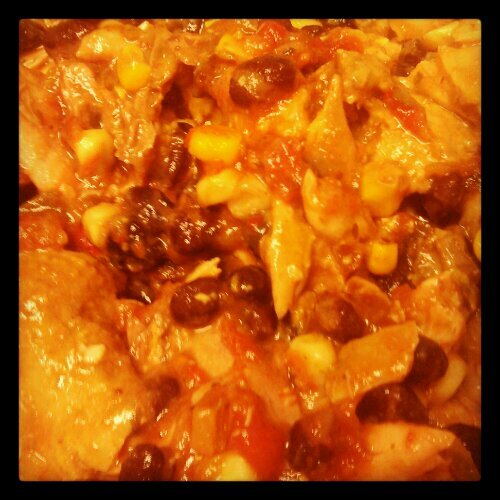 Mix all ingredients in a large bowl and spoon into tacos, burritos, tostadas or you could make enchiladas with it. Sometimes the best most delicious dishes are really the most simple and unadultered…like this one.